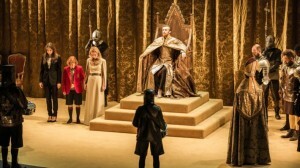 The RSC’s Richard II is onstage at last, and I’ve got to one of the performances. I’ve seen quite a few past productions of the play onstage, some extremely memorable. Like Hamlet, it’s often judged by its central performance, but both plays need a really strong company to be successful. In Hamlet Doran fielded the strongest RSC team for some years, and in Richard II he’s done it again. David Tennant had his greatest RSC success with Hamlet, but Richard II is a different kettle of fish. Richard is more interested in himself than anyone else, and can be hard to like. This makes him a challenge for any actor, and I was interested to see how David Tennant, an actor who thrives on communicating with the audience, would play the role. I’ve seen many notable productions with strong central performances. To begin with Tennant often reminded me of Jeremy Irons in 1986, both glamorous, physically alike and both exhibiting boredom when faced with quarrelling nobles. Michael Kitchen was a down to earth Bolingbroke who seemed to inhabit a different England from the gorgeously illuminated medieval book of hours that Irons lived in. But whereas Irons never managed to escape the limitations of this setting Tennant brought his usual nervous energy to bear throughout the king’s decline and fall. Alan Howard’s golden Richard, in 1980, was described by Michael Billington as “peacock-proud”, with “star presence”, making his decline painfully humiliating. I remember it as a richly-spoken production with David Suchet as a striking, emotional Bolingbroke. The difference in style between Richard and Bolingbroke was also apparent in The Other Place production in 2000, in which Sam West’s intellectual, self-aware king was contrasted with David Troughton’s bullish, angry Bolingbroke. The production presented different versions of modern England, with football chants played as the audience assembled and a pile of freshly-dug earth on the stage floor. For me one of the most striking images of the play was Troughton, when banished, picking up a handful of earth, dropping it only when he arrived back in England. Another memorable production, also staged in a small auditorium, was that at Bristol’s Tobacco Factory in 2011. John Heffernan’s King was immature rather than bad, a victim who did not deserve his tragic end. Heffernan is currently playing Edward II in Christopher Marlowe’s play at the National Theatre. The King’s desperate need for personal relationships drives Marlowe’s play, and this eccentric but enjoyable production moves between the period of the play and today, and between the onstage and the backstage world. This link is to a post that compares it with the RSC’s Richard II, and this link is to a interview about the play with the director and Heffernan. The current production is full of ritual, formality and sophistication. The seemingly-simple, elegant set features projected backdrops, a smoothly-gliding stage bridge and an understage setting for Richard’s dungeon. The religious imagery is insistent and appropriate. Three sopranos sing sumptuous heavenly music written by Paul Englishby. 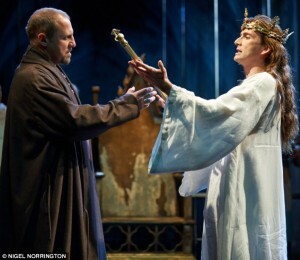 The projections place us in English cathedrals, and Tennant’s costumes and long hair are reminiscent of paintings of Christ. The poetry of the play is beautifully spoken by a cast including experienced Shakespeareans Michael Pennington, Jane Lapotaire and Oliver Ford-Davies, who all make it look easy. David Tennant isn’t afraid of being unlikeable, particularly at the start, though here and there I would have liked him to resist the temptation to make the audience laugh. 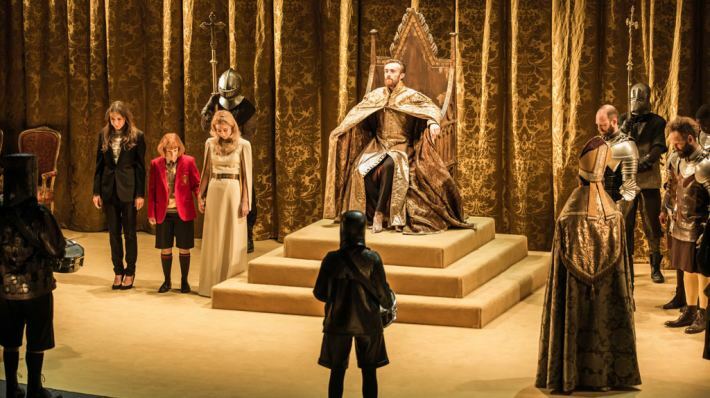 As the first production in the six-year cycle of all Shakespeare’s plays announced by Doran when he took over as Artistic Director of the RSC, Richard II lays down a marker. Above all, it illustrates his determination to strive for quality above quantity, and bodes well for the next few years. 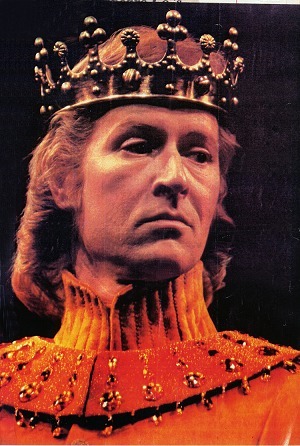 Wyver’s thoughts about Richard II, and ten things he likes about it. This entry was posted in Plays and Poems, Shakespeare on Stage and tagged Alan Howard, Jeremy Irons, John Heffernan, National Theatre, Richard II, Sam West, Tobacco Factory. Bookmark the permalink. Thank you for linking to my blog. I loved both Edward II at the NT and Richard II at the RSC, and being able to talk about them in parallel was a huge pleasure. Thanks for your comment: I agree it’s been stimulating to be able to think about both productions together. I very much enjoyed your blog. I loved Jeremy Irons as Richard II. Really, really, really did not like David Tenant’s rendition – Richard II was self-absorbed, but he wasn’t a “twit” as one of my “Shakespeare Lovers” members put it. David Tenant’s brattish rendition left no room for “tragedy.” What’s tragic about a brat’s downfall? I would give ANYTHING to see clips of Jeremy Irons’ perfect performance, or in the very least, hear it! He exuded “tragedy” – the tragic condition of being a poet, but one who can’t be a pragmatic ruler, and yes, is too self-absorbed. But man…. what a “poet!” and Irons made the “tragedy” come through impeccably. Thought to share! From out here in Washington DC! I have a small reading group “Shakespeare Lovers” – (part of meet up) and read, dissect and savor one play per season! 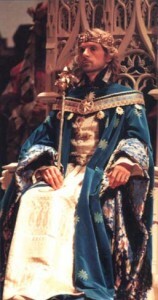 Richard II, via Jeremy Irons, is how I fell in love with Shakespeare. And I doubt it that I’d ever see a more perfect rendition! A little note from one fan to another! Thanks for your comment. I’m delighted to hear Jeremy Irons’ performance had such a profound effect on you. From your post I see you’re in Washington, DC, but in case you’re ever over in this country there should be a sound recording of the production at the British Library, and there’s a video in the Shakespeare Centre Library and Archive (neither are available to borrow). Both were recorded off the stage so are not high quality. Incidentally, Jeremy Irons read T S Eliot’s Four Quartets on Radio 4 over the weekend. I’m never sure if these are downloadable from the US. If you love Jeremy Irons’ voice you would enjoy them. I’m actually thinking of posting a blog about Eliot and Shakespeare…. Presumably you have seen his performance in The Hollow Crown, now available in the US on DVD? Yes, I live in Washington DC – but was born in Tehran, and grew up in London (Hampstead.) Gosh, I do miss the spectacular acting! Thank you for all the information on how I could catch a recording of Jeremy Irons doing Richard II. We’re currently readying the play with my group – we’re a small group of 95 members, part of a Meetup here in the Washington area. And I am going through the Ben Whishaw performance. He does bring the “tragedy” through – unlike the Tennant performance that showcased the king’s fickle side, but never took me to his “tragic” side – that Richard was too much of a “twit” to be “tragic” and the performance broke my heart. Ben Whishaw is helping to restore it! A Blog about Eliot and Shakespeare sounds fabulous. I’m only mentioning it as I find the European Renaissance has much in common with the East. Literature as a way to facilitate a “heaven on earth” – the arts in general, being a vehicle of transcendence. Where story telling has layers that go beyond the tale at hand. And I now know both my Hafez and Shakespeare (well, the plays we’ve studied) pretty well – to find constant parallels. So… I’m working on a book. “Measure for Measure” was our last play and the book is going to be me reading “Measure for Measure” to Hafez, and Hafez responding – and facilitating echoes and parallels. I will also be telling my group to go to your site for a wealth of information. They say the happiest people are those who do what they love, at the service of others.